Any business has to plan for the future. In the dairy industry, that future relies largely upon the health and well-being of the calves. Fairmont knows that healthy calves mean good cows in the years to come. Calves are born all year at Fairmont, with between 2 and 8 calves born every day. A calf’s life starts in a brand new calving barn, where pregnant cows are separated from the herd and moved to a low-stress pen when ready to calve. Cows are heavily monitored as soon as signs of calving begin to protect the health of the cow and her calf. Immediately after the calf is born it is cleaned by the mother. Once the mother has done her important job, the calf is fed for the first time. Newborn calves are fed two feedings of special milk that is produced immediately following calving. This special milk is called colostrum. About 10 hours later the calf is moved to the calf barn to join her new friends. In 2011, Big changes came to Fairmont. Outdoor calf hutches were a thing of the past and it was time to bring new technology to the future of the herd. Calves are housed in a variety of ways throughout the dairy industry. Many small farms house calves with their older animals in a tie stall facility. Other farms house calves in outdoor hutches, indoor hutches or in Fairmont’s case, group housing. “Now in our new calf barn, we’re raising bigger calves” says farm partner Tucker Purchase. Calves are growing bigger because of their constant availability of fresh milk. 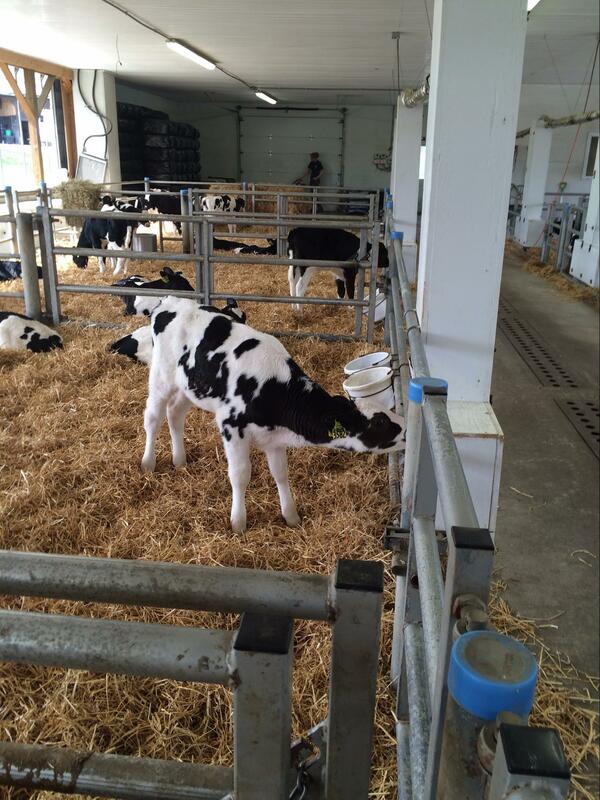 Calves at Fairmont live in a modern, group housing facility with access to whole milk 24/7. The barn has 16 pens with 7 or 8 calves in each pen. Every other day, calves are given fresh straw bedding so that they have a comfortable place to spend their time. The calf barn is ready for any weather. In the summer, the barn sides remain open to let in fresh air. Part of the barn’s technology advancement is the exterior air curtains. Curtains are automatically inflated when temperatures fall keeping warm air inside. Calves are also given special made blankets in the winter to keep them even more comfortable.